When Jennetta McDonald walked through the red double doors of The Diaper Train today with a smile as big and bright as the morning sun, we knew we were in for a treat. At one time a client receiving diapers for her grandson and godchild, Jennetta is now a volunteer distributing diapers to others who are where she once was: In Need. 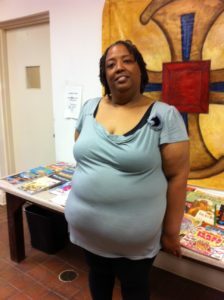 Knowing how important it is for people to feel comfortable and cared for the moment they arrive, Jennetta warmly greeted each client, chatted with the children, and directed folks to the book table while they waited for their orders to be filled. Although she’s currently taking online classes to become an office assistant, Jennetta found a little extra time on her hands to help. We’re thrilled – and inspired – that bringing her special cheer to The Diaper Train is just one of the ways our “graduate” is giving back to her community! Would you like to volunteer with us? Click here to sign up!